Tantalizing vestiges of our ancient Atlantean superculture are slowly merging to provide a new resonant view of the monumental stone construction techniques and globally integrated linguistic heritage that lie beneath our feet. 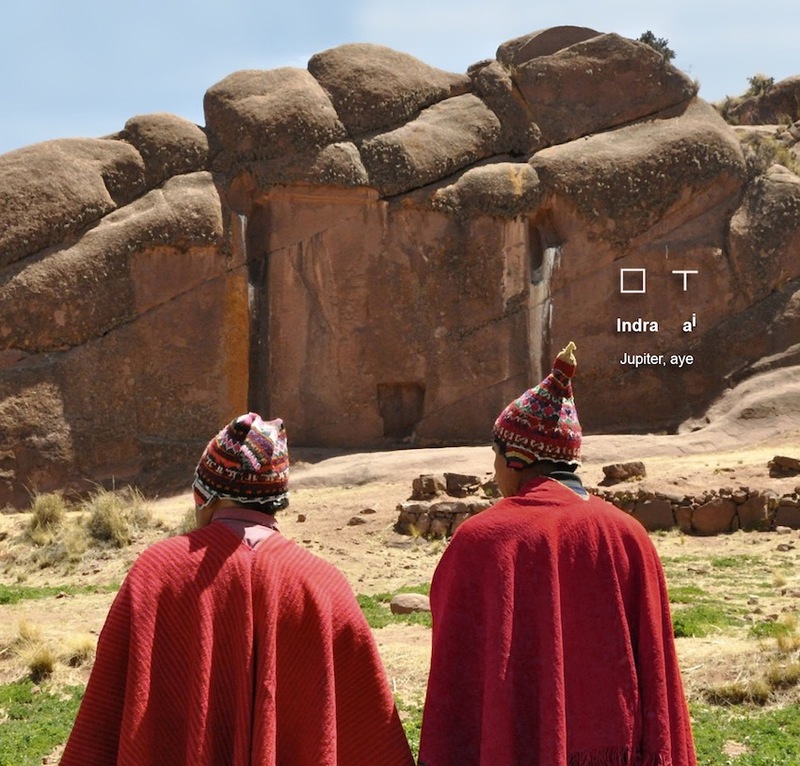 The Amaru Wall in Altarani, Peru is a sacred monumental wall portal site comprising a large outcropping of red granite that has been carved flat and engraved with a symbolic doorway. The red granite rubble removed from the wall treatment was most likely used reconstituted as geopolymer stones for the construction of a temple that remains today as foundation structures located adjacent to the Amaru Wall. Unidentified until now, the massive square embedded into the wall design represents a votive inscription that, along with the inset portal recess, reads: Indra ai , meaning " Jupiter, aye" (above). These hieroglyphs are still used to this day in the colorful hats, ponchos and other textiles woven by present-day descendants of the once high Atlantean superculture. 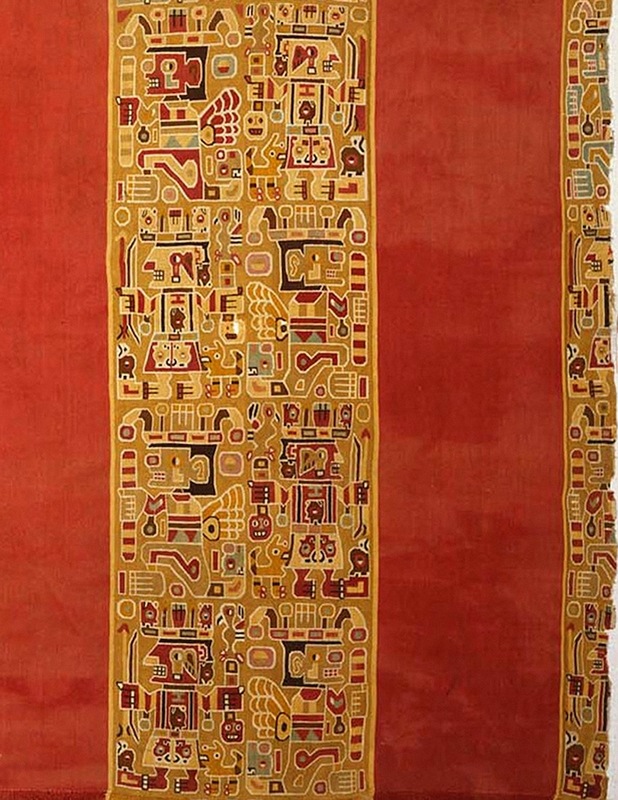 The Andean people of today know these sacred symbols very well --they simply do not know the specific meaning of each word, nor the significance of the Atlantean physics of planetary resonance being so mesmerizingly expressed in these refined textiles. The ancient Vedic physics of standing wave resonance has been restored by the valiant research efforts of inventors like Nikola Tesla and Georges Lakhovsky, whose revolutionary advances in bioelectrical healing foreshadowed the present breakthroughs defining biological nuclear transmutation regimes. Enhanced electro-acoustic states were achieved by artificial stone production techniques that employed a mix of fine ferromagnetic metal particles for increasing the strength of electromagnetic fields transduced by the stone itself. 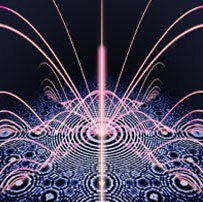 Infrasound focused by the geometries of the Great Pyramid enabled biorhythmic synchronization. Votive statements embedded in the design layout and facades of stone monuments concisely reference the sacred physics applying planetary resonance and emanations from Jupiter for the bioelectrical healing and enlightenment of humanity. 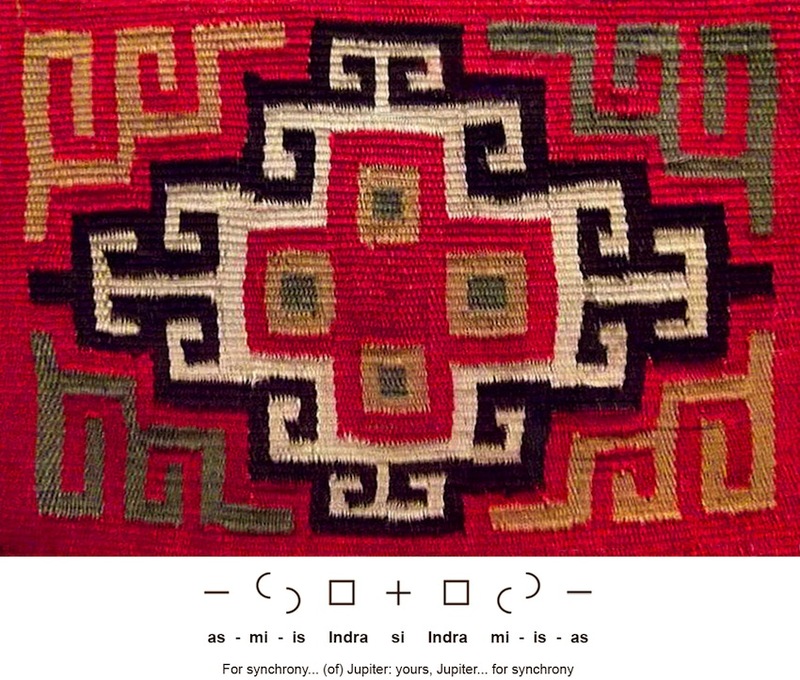 Sacred pictographic texts of the Inka elevated the divine influence of Jupiter, reading: as-mi-is Indra si Indra mi-is-as , meaning "For synchrony... (of) Jupiter: yours, Jupiter... for synchrony" (above). The extraordinary beauty of ligature compositions reiterated in Andean textiles have been completely ignored by epigraphers, yet can be identified and translated as Paleo-Sanskrit texts. Brightly colored designs covered the architecture, woodwork, ceramics and textiles of the Wari culture centered in the Ayacucho Valley situated just east of the ancient city of Cuzco, Peru. 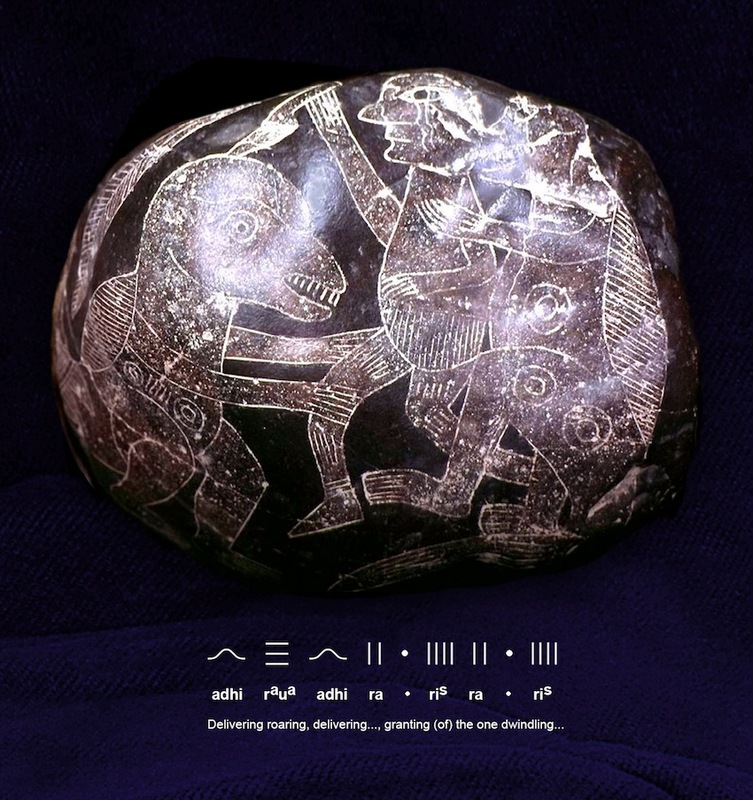 While advanced geopolymer stone construction techniques used at Saqsaywaman point to a much older origin in the Paleolithic period, the geometric Sanskrit language was well maintained by successive cultures. 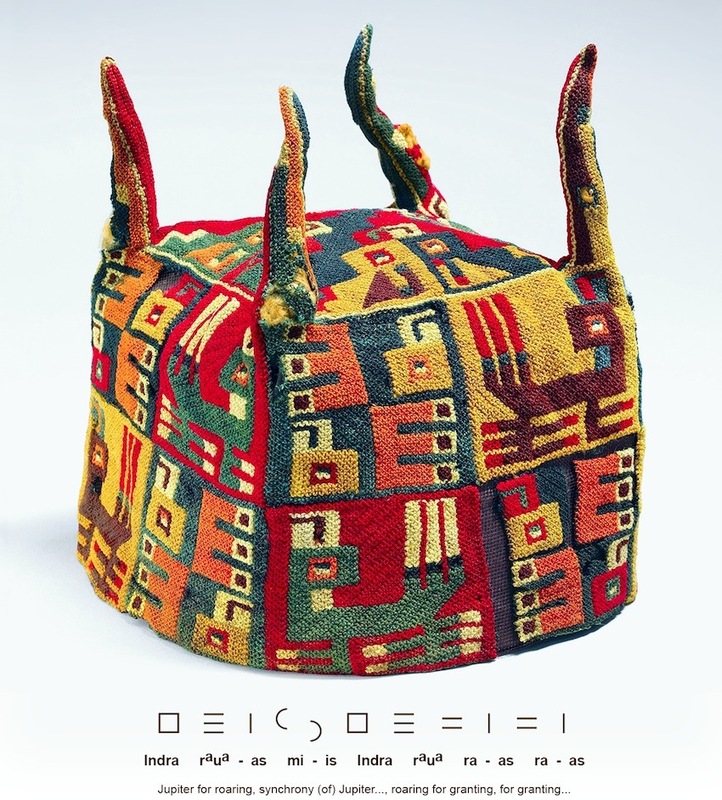 A woven hat shaped as a cube offers votive phrases within four squares: Indra raua-as mi-is Indra raua ra-as ra-as , meaning "Jupiter for roaring, synchrony (of) Jupiter..., roaring for granting, for granting..." (above). As the dominant design element in Wari sacred patternwork, the square Indra glyph was reiterated dozens of times on every item of ceremonial clothing, objects and funerary items of all kinds. The most impressive architectural ambitions achieved by the Wari phase of Andean civilization less than 1,500 years ago were designed around this essential format of the square glyph signifying the giant planet Jupiter. 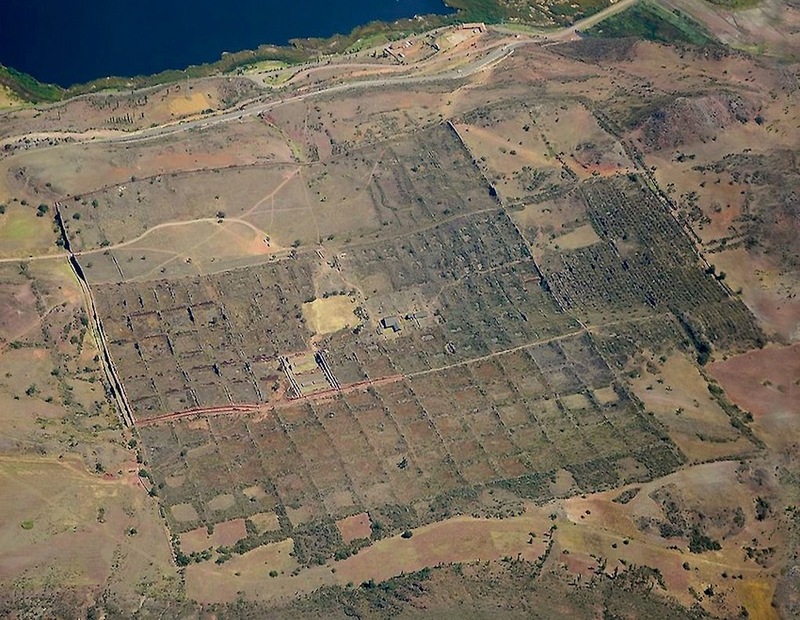 The bold design plan of the entire Wari sacred city of Pikillacta was laid out as a gigantic square, subdivided into more than 200 square and rectangular divisions defined by a tight grid of basalt stone walls (below). 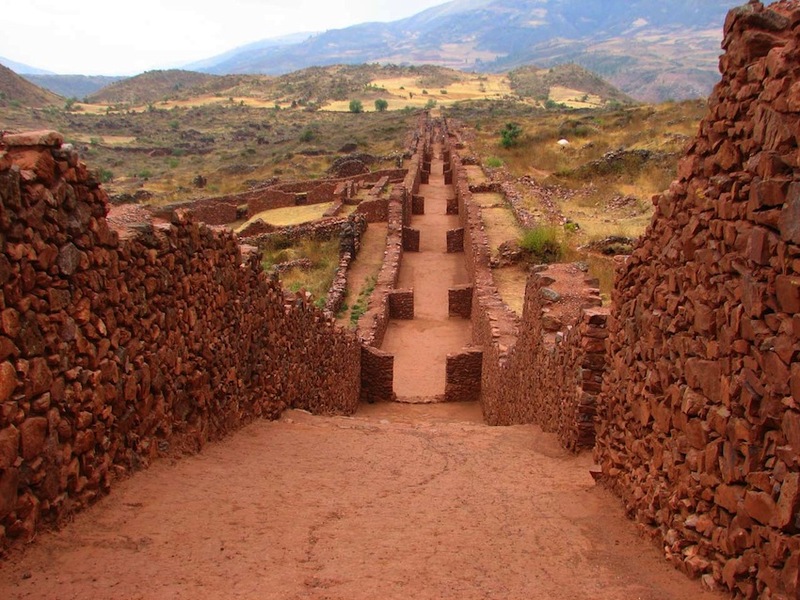 The ancient Wari city of Pikillacta, in present-day Peru (13.613°S 71.716°W, above), is located 7,446 miles from the Great Pyramid --a distance comprising 29.9% of Earth's mean circumference, corresponding to the Fibonacci ratio (2 : 3 : 5). The square 'Jupiter' city grid is nestled tightly into the valley and oriented parallel to the adjacent lakeshore, where all the necessities for life were once harvested from its sacred waters. Measuring 1.0 x 0.7 miles in length, Pikillacta displays acoustic calibration established by the regular ~280' spacing of ~30' high, ~8' thick walls for resonating at 3.9 Hz and 7.8 Hz --the fundamental frequency of Earth Resonance. The 1,440' square in the northwest corner is bisected at 770' corresponding to the base length of the Great Pyramid and resonant 1.45 Hz heartbeat frequency for biorhythmic synchronization. Excavations at Pikillacta have focused on the administrative center of the city and in uncovering a lengthy, intact segment of a perfectly straight, walled road running across the hills of the northeastern sector of the grid plan. The throughway was marked by a regular sequence of large square portals that have been largely preserved along with the walls themselves (above). Elevated iron levels in the soil produces the rich red hue typical of infrasound hotspots where the Great Pyramid focuses planetary resonance. Seen from directly above, the Great Pyramid also forms the outline of a square which also signified the planet Jupiter for the ancient Paleolithic pyramids-builders who built Sanskrit glyphs into the design of relieving blocks above the main entrance and left inscriptions on those blocks that are still visible today. 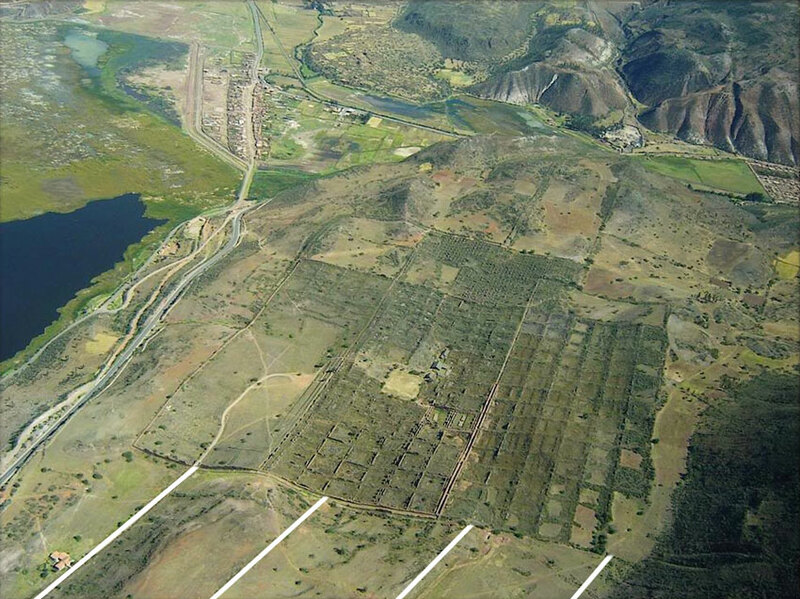 The high walls of Pikillacta extend beyond the square enclosure in offset parallel rows (in white, above), marking the resonant 30% distance band shared by Tayos Cave and the pyramids of La Maná, Ecuador. 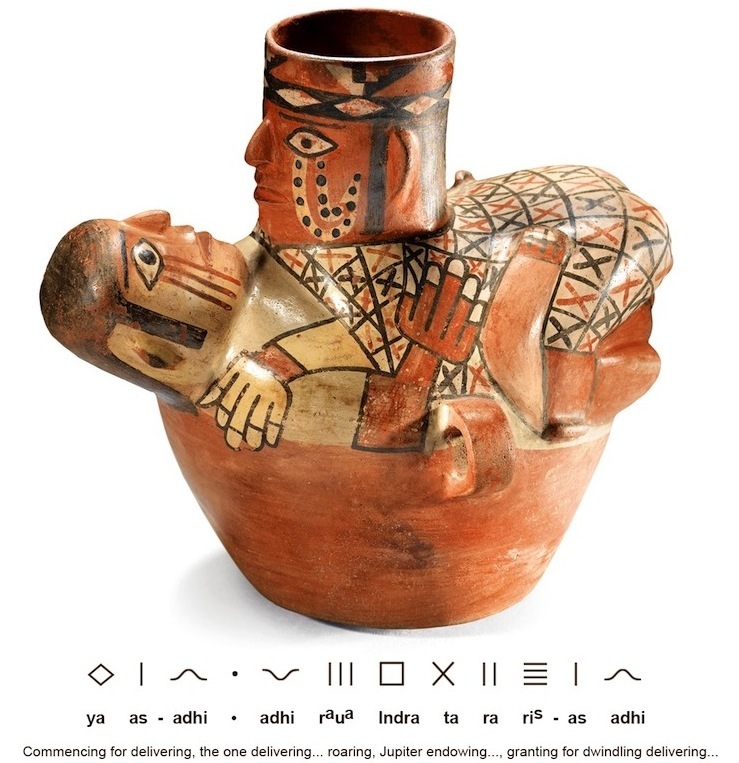 The inhabitants of Wari cities and their descendants of the Inka cultural phase used the same essential glyph patterns and psychoacoustic architectural technologies, with their inset niches for binaural ceramic whistles, revealing a direct and unbroken line of high knowledge inherited from their Atlantean forefathers. The bold design plan of Pikillacta replicates hieroglyphic designs of square geoglyphs, both in present-day Kazakhstan and the Amazon, echoing the giant square format of the Atlantean canal-city of Poseida. 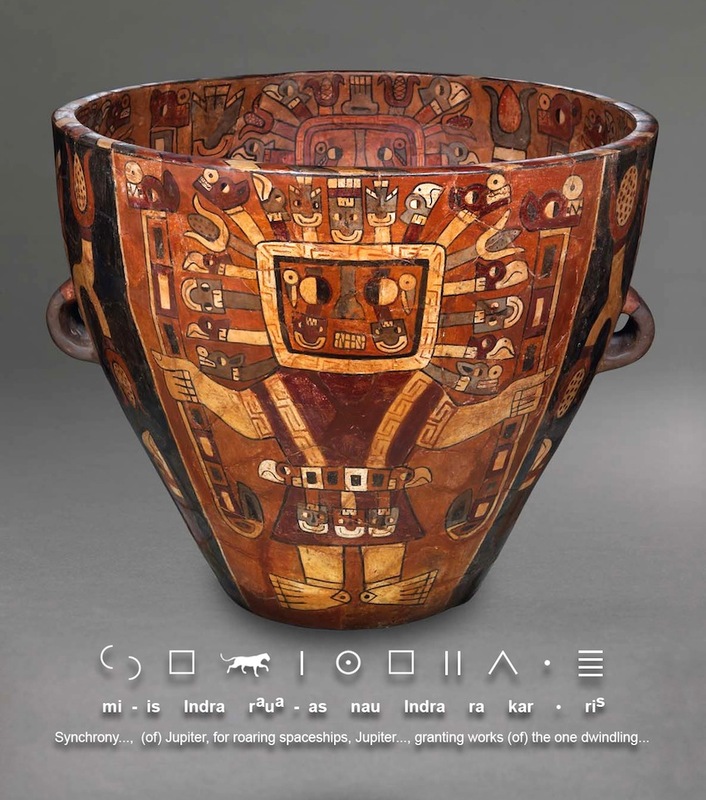 A Wari vessel displays a fanged figure's square head enclosed by a band of 'mi-is Indra' glyphs and other ligatures reading: mi-is Indra raua-as nau Indra ra kar * ris , meaning "Synchrony (of) Jupiter, for roaring spaceships, Jupiter..., granting works (of) the one dwindling..." (above). 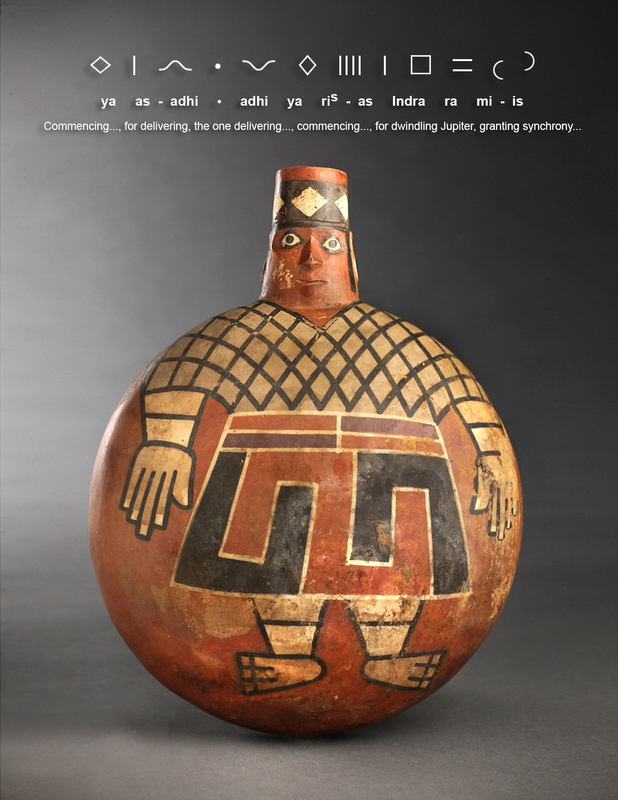 The statement is reiterated on an oblate spherical jug painted with a Wari Lord in a poncho showing standing waves as a grid of ya and adhi glyphs. The full text reads: ya as-adhi * adhi ya ris-as Indra ra mi-is , meaning "Commencing..., for delivering, the one delivering..., commencing..., for dwindling Jupiter, granting synchrony..." (below). 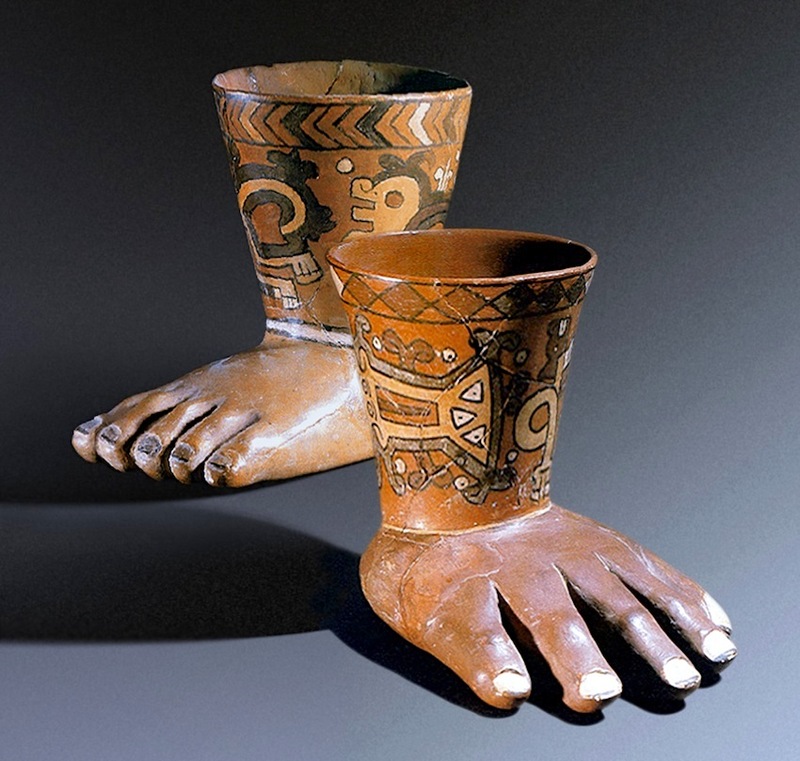 Highly skilled Wari craftsmen created kero drinking vessel designs with bases shaped as hands and feet, referencing their direct physical contact with sacred piezoelectric temple stones that transduce an electrical charge from the infrasound resonance of Jupiter, as focused by the Great Pyramid. Votive hieroglyphic statements painted on the vessels offer familiar sentiments revealing their particular ceremonial use. 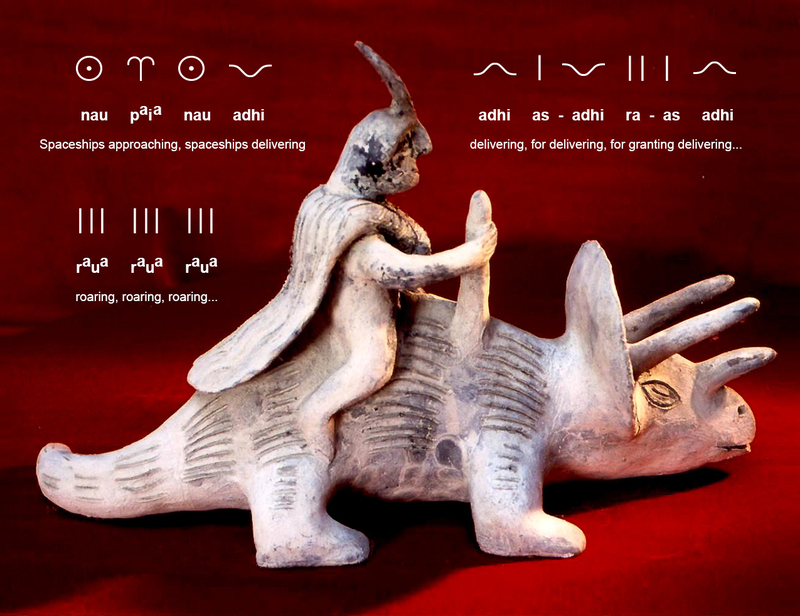 A kero shaped as a foot is painted with roaring pumas and glyphs that read: ra kar * adhi raua Indra ra , meaning "Granting works... (of) the one, delivering roaring (of) Jupiter granting..." (above). 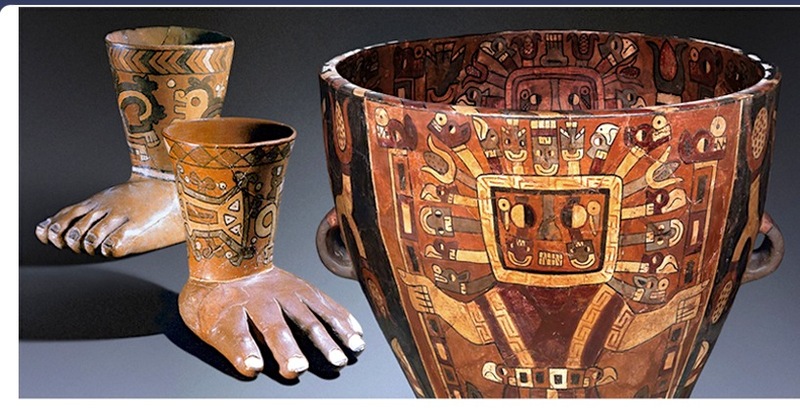 This refers to the vessel's use for imbibing Soma, a colloidal 'elixir of life' with nano-gold and -silver, that enhances electrical conductivity within the body for qi healing practices undertaken within caves and resonant temple walls. Another kero formed as a hand is painted with whale ligatures for 'Indra', reading: ya ra upama nau paia, nau adhi ra-as upama * , meaning "Commencing granting (of) the highest..., spaceships approaching, spaceships delivering for granting of the highest one..." (above). Initiation into temple life among Sanskrit cultures practicing qi healing required drinking celestial waters and direct contact with resonant stone. 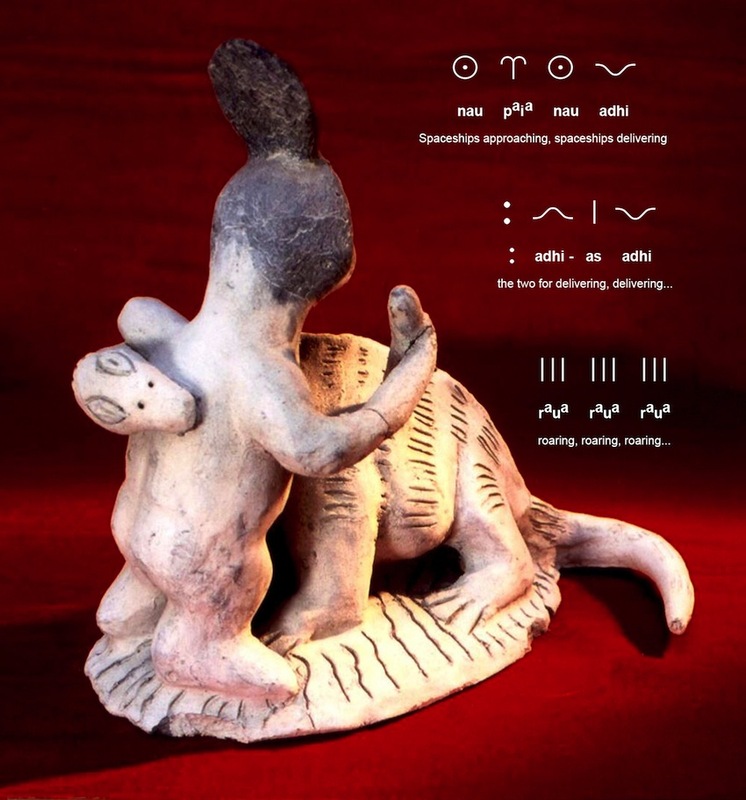 An interesting example of a jug for Soma depicting a Wari couple in coitus deals with the subject of human reproduction and fertility in a much less explicit way than many other ceramic pieces. Clear statements glaze painted on the vessel affirm Soma use for conception in temples under the influence of Jupiter's rumbling: ya adhi-as * adhi raua Indra ta ra ris adhi-as , meaning "Commencing for delivering, the one delivering..., roaring, Indra endowing..." (above). Infrasound from Jupiter endows fertility and vitality. 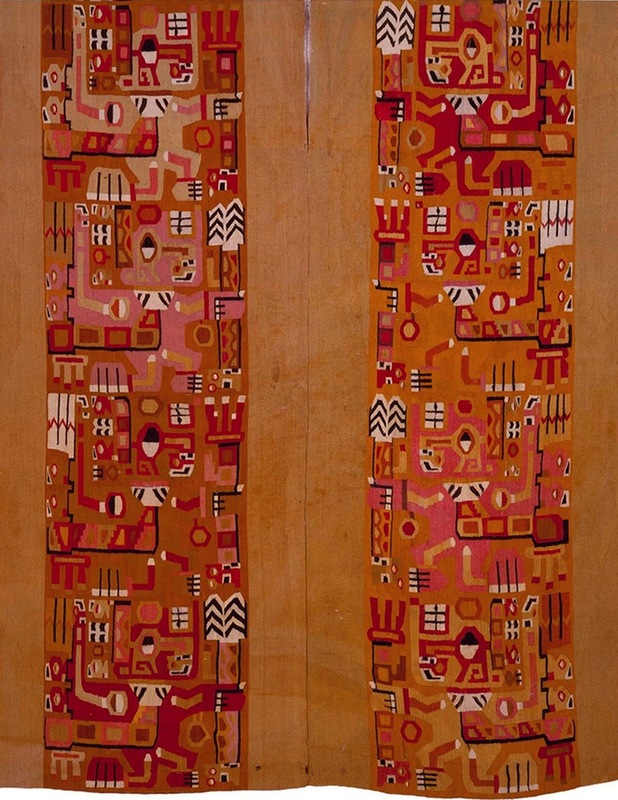 Giant square tunics woven in fine alpaca wool praise Jupiter's resounding works, with hypnotic ligature arrangements embedded in columns of repeating Hero Twins motif bearing staffs with rows of kar kar kar glyphs for 'works' (detail, above). These glyph ligatures are seen in Paleolithic artwork from all over the world, while such expressions had lost significance in many regions by the time of the Wari culture, over 11,500 years after the cataclysmic cometary destruction of the Atlantean continent of Poseidia. Suppression of the comprehensive Paleo-Sanskrit decipherment by epigrapher K. Schildmann has entirely relegated his unfinished work to the cordoned sidelines of academia, yet provides the only opportunity for understanding Paleolithic culture throughout the world. The job of decipherment now falls upon those few who recognize the great importance of the legacy of psychoacoustic resonance that preceded our times. A large collection of enigmatic and suppressed Atlantean artifacts displayed at the Cabrera Museum in Ica, Peru (below) was recovered from an undisclosed cave. Paleo-Sanskrit texts on totems, ceramics and basalt stones of all sizes confirm their genuine antiquity, offering a wealth of imagery including dinosaurs and complex surgical procedures. One stone shows two tyrannosaurs attacking a giant human reading: adhi raua adhi ra * ris , or "Delivering roaring, delivering..., granting (of) the one dwindling..." (above). While such ancient depictions of dinosaurs attacking giant humans may strike many today as incredible, advanced Vedic knowledge of long extinct epochs being consistent with a human presence on Earth millions of years ago bears serious consideration. The reality of advanced neurosurgical procedures having been conducted by Atlantean healers is proven by cranial remains that verify depictions on the Ica stones. One depiction of neurosurgery on a low platform reads: Indra ra raua Indra adhi raua ris Indra kar-as , meaning "Jupiter granting roaring, Jupiter delivering roaring dwindling, Jupiter's..., workings..." (above). Another boulder offers: kar-as Indra Indra adhi ra * adhi vi ra raua ris , meaning "Workings... (of) Jupiter, Jupiter... delivering granting (of) the one, delivering from granting (of) thundering dwindling..." (above). 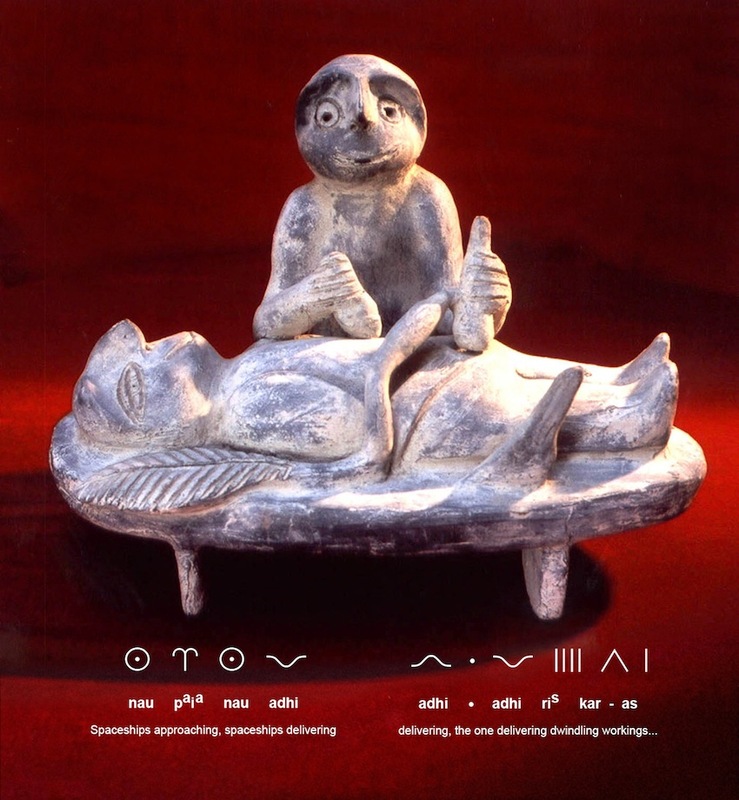 Dozens of unusual ceramic figurines of the Cabrera collection include a small reclining figure receiving bioelectrical qi healing on a specialized low oval platform from a qi practitioner (above). Stone tools focus yin from the healer, represented by the leaf, balancing elevated yang represented by the lingam. The healer's curious face represents a known glyph ligature that reads: nau paia nau adhi , signifying "Spaceships approaching, spaceships delivering." 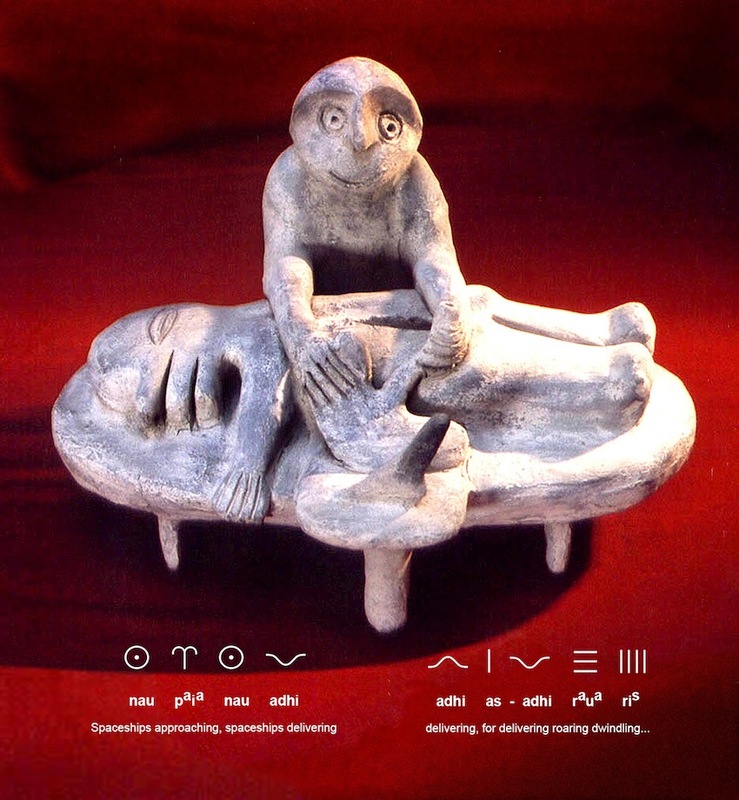 Other glyphs marked on the healers hands, the recliner's eyes and the leaf representation connected to the energy cord flowing from a hand with the tool, reading: adhi * adhi ris kar-as kar-as , meaning "Delivering, the one delivering dwindling workings, workings..."
The 'spaceships approaching' face ligature design was also replicated in ceramics at Glozel, France that were duly confirmed by radiocarbon analyses as dating to Paleolithic times. Another quite similar ceramic sculpture presents an identical healer with the wide-eyed expression, seated at a low oval healing platform performing kidney transplant surgery, with the organ and abdominal incision clearly seen (above). 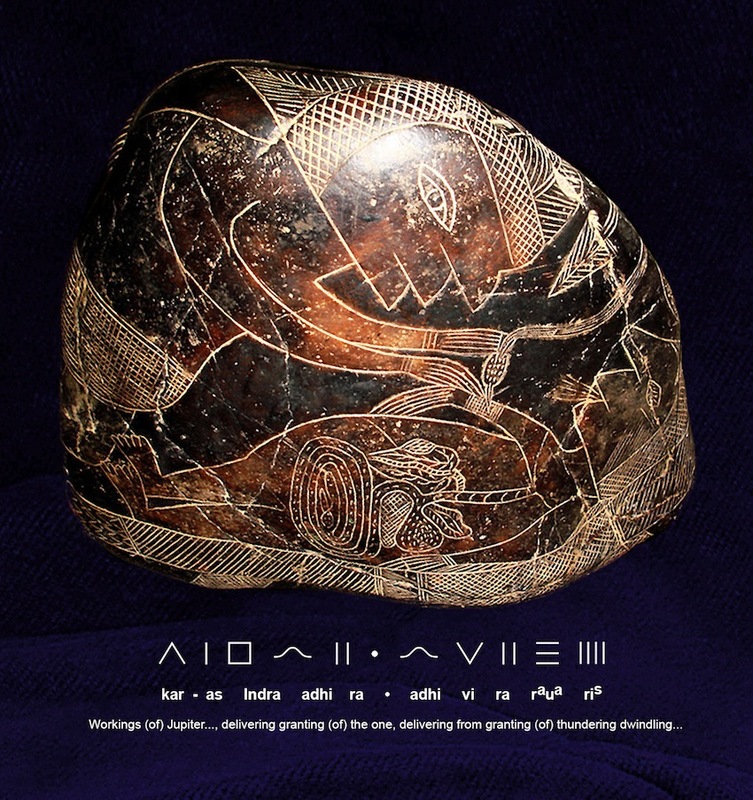 Once again, the full set of glyphs incised in the clay sculpture provides quite a similar statement to the first: nau paia nau adhi adhi as-adhi raua ris ris , for "Spaceships approaching, spaceships delivering..., for delivering roaring dwindling, dwindling..." Roaring vimana once transported people and goods worldwide. As previously discussed in the context of many other votive artifacts from the bygone Atlantean era, the gradual diminishing of thunderous infrasound reverberations from the planet Jupiter were lamented as causes of illness and death such as cancer and kidney disease steadily increased among the population. This sentiment is closely echoed in Paleo-Sanskrit texts from Glozel, France where such unusual imagery incited derision from academics who still avoid all serious consideration of the many profound implications of Atlantean high knowledge: "Jupiter: that declining brilliance, evil building, also death, reducing the good spaceships brilliance for granting, darkness growing, oh, the era for delivering that, for the flooding." Atlantean sculptors and authors of votive texts could not have been more clear in their statements concerning the resonant source of abundant acoustic energy once utilized by the wide array of 'wireless' pyramid and spacecraft technologies during their high epoch: infrasound from the giant planet Jupiter. Repeated statements from ancient pyramid-building cultures distributed throughout the Americas, and indeed throughout the world, are now building into a harmonious chorus of ancestral voices reminding humanity of our elevated past civilizations and bioelectrical healing technologies based on infrasound. The dinosaur motif is used to represent the roaring of the pyramids, as reinforced by the many raua glyphs. 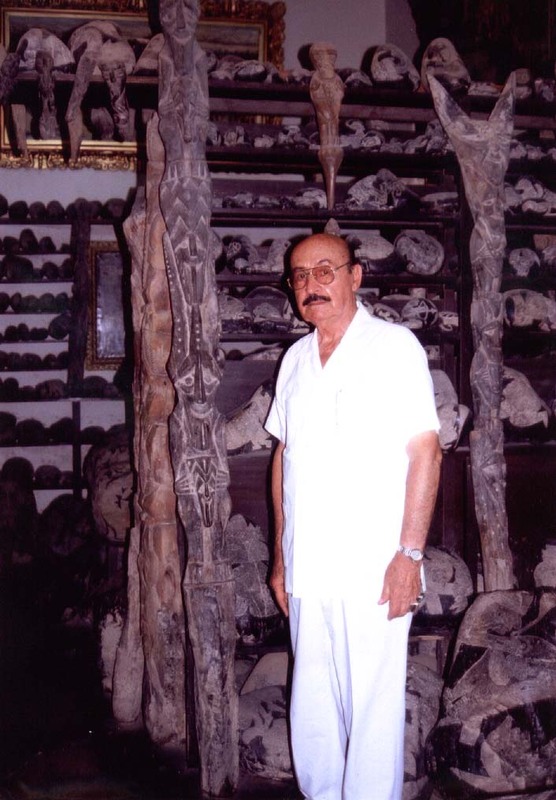 The stupefied expression on the faces of the healers are duplicated among other Paleo-Sanskrit artworks; in lydite figurines from Sutatausa, Colombia; ceramic figurines from Tayos Cave, Ecuador and etched on megaliths at the lost White City, Honduras. Despite distinctive styles, the glyph phrases are very consistent. 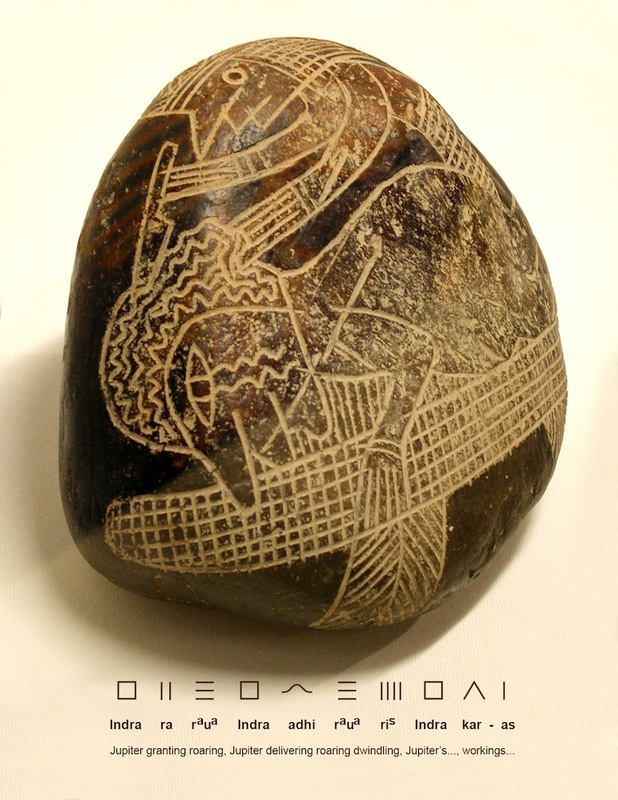 When one considers the repetitive content of expressions in sacred texts inscribed on these artifacts, such culturally specific imagery repeated on all continents of the world represents the greatest form of evidence attesting to the infrasonic workings of the Great Pyramid that once resounded throughout the entire world.